Rinpoche decided to accept to give an initiation to someone who requested it. The initiation was scheduled to happen Sunday. We were scheduled to leave Madison early Monday (from Deer Park, Geshe Sopa-la’s center) after an 8 am appointment with the doctor (Rinpoche’s sugar levels and blood pressure are better) and to start driving to Milarepa Center in Vermont. The initiation was changed to 4 am Monday in the “busy-ness” of things! Now it is Monday afternoon and Rinpoche is somewhere in the middle of preparing … and we haven’t left. Still not finished with the preparation, Rinpoche decides to make dessert while we are running around packing and trying to figure out what is going on! The dessert: mash potato, more butter than one would want to even dream about, non-fat half and half, honey, and Greek yogurt poured on the top. Rinpoche passes it around to the attendants who are running around … not bad actually – Rinpoche doesn’t eat any. When will we leave Madison, we are six hours late and the initiation hasn’t started. Its Tuesday, August 31, 10:30 am – I think we are going soon? Only 26 hours late. The initiation finished at 3:30 am this morning. There have been some pujas here and there for people seriously sick and some deaths. Sometimes these things are complicated and take time. All sorts of things have to be managed! Geshe Sopa Rinpoche’s monastery, Deer Park, is located outside of Madison, Wisconsin in a rural area. 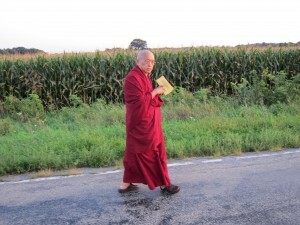 While at Deer Park, Rinpoche has been exercising daily by walking in the early evening as the sun is going down. We walk for an hour along a narrow country road, corn fields on either side. Rinpoche walks in front and recites a text out loud, each day a different one. I walk behind closely watching for cars, sometimes doing emails on the Blackberry and trying to keep the speed at a good pace. Every time a car goes by Rinpoche waves. Most of the time people look surprised but wave back happily. Warm country folk. One day Rinpoche had a hand puppet so when he waved a funny looking dog with big ears was actually waving! Then Rinpoche would go back to reciting the text loudly. The area attracts lots of mosquitoes and other kinds of sharp biting insects! Rinpoche isn’t interested in any protection and thinks it is just a small offering to these little guys. Rinpoche is taking Tibetan and Western medicine, he’s been circumambulating His Holiness the Dalai Lama’s temple every day for at least 40 minutes and watching the food he’s eating, particularly the amount of carbohydrates. He’s even making an effort to rest a little more from time to time. The result is that his sugar levels are down quite a bit! They are still not normal but a lot better. This is very good news! Let’s see if this can continue when in the USA and when traveling. Rinpoche’s blood pressure still needs to come down…but it is little better. Rinpoche has scheduled a 6 am departure from Tushita (Rinpoche’s retreat finished), then a departure to Delhi 13 hours by car, then a flight to LA via Hong Kong, and then another flight to Wisconsin to be with Geshe Sopa Rinpoche. It’s now 10 am and Rinpoche is still doing prayers and not ready to go … just waiting … It is 12 noon and still no sign of Rinpoche wanting to go … It is 2 pm – Rinpoche suddenly moves and they are off! They stop for dinner halfway to Delhi, its very hot. Rinpoche takes time out to check mos for a student who has cancer. There are many mo’s at the dinner table in the restaurant. On the road again, and while they’re driving, Rinpoche is checking some other things for people who need help. It looks like they are arriving early, early morning and then a little rest, a couple of appointments and then to the airport to catch the flight. This time the flight is complicated as they are combining two different air tickets due to a number of changes, and then they have some visa complications due to changes and then they have too much luggage and one less person flying … not sure how this is all going to work … but managing. Rinpoche’s retreat is going well. 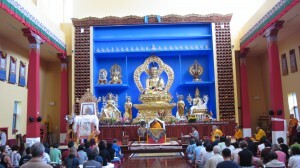 It is a group retreat with eight other lamas, two Khadro- las, and 40 senior monks. The schedule is good. The first session starts at 6 a.m., going through to lunch. The second session begins at 1:30 p.m., going until about 6 p.m. That’s it! Rinpoche has a quick lunch with Pari Rinpoche, nicely prepared by Sangpo and Tenzin. When the second session finishes Rinpoche goes to Khadro-la’s place. Khadro-la has Rinpoche do some exercises, similar to those found in the Six Yogas. They then they have dinner together and after dinner Khadro-la kindly brings out her prostration board for Rinpoche to do prostrations. This finishes around 10 p.m.
Rinpoche’s sugar levels seem to be slowly coming down, but they are not yet sweet! It is going to take time but hopefully with a little rest, medication, exercise and Rinpoche’s new determination (fueled by the advice from His Holiness! ), it will be OK.
Rinpoche is in retreat which started about 10 days ago. Prior to the retreat, Rinpoche met with His Holiness the Dalai Lama. 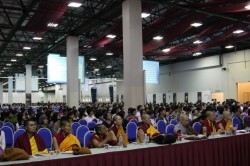 It was a relaxed meeting (meetings with His Holiness in recent times are quite brief and to the point because of the very demanding schedule that His Holiness has, but, the occasional more-relaxed appointments do occur) and His Holiness expressed his happiness with Rinpoche and the activities of FPMT. His Holiness also expressed concern about Rinpoche’s health and said that Rinpoche should now start to take Tibetan medicine for diabetes and blood pressure. His Holiness asked his own doctor (a Tibetan nun) to see Rinpoche. Later, Rinpoche also went to see His Holiness’ Western-trained Tibetan doctor. Both prescribed medicines Rinpoche is now taking (with special diligence because His Holiness said he should take care of his health). I think Rinpoche is taking his health more seriously now and putting in more effort into exercising, taking medication and resting … I hope. Rinpoche had the flu the whole time we were in Hong Kong. I think it started in Malaysia. It got heavy as the days went by, but Rinpoche kept to the schedule, refusing to lighten the load. Rinpoche insisted on going shopping to buy gifts, even though the flu was quite heavy. So off we went to one of those big glittery name-brand Hong Kong shopping malls (this one was called Times Square). Rinpoche shops by doing observations in front of potential gifts, seeing which comes out best for a particular person. Immediately, Rinpoche was shopping for gifts for His Holiness, very nice and unusual things. Of course, I’m carefully reminding Rinpoche of how much extra luggage this means (which is way more than we can manage). This isn’t making the slightest impression on Rinpoche. We have been all over the shopping mall and I can see that Rinpoche is quite exhausted with the flu. So it is tea (and coffee) break at Starbucks. There are quite a few students following behind, being quite helpful by carrying the gifts. Tea, coffee and snacks for everyone! Opposite Starbucks is a specialty shop with really nice stationary and supplies. Rinpoche goes in and buys many different kinds of nice fancy notebooks. He then sits down again in Starbucks and gives each helpful student a nice notebook for writing Dharma quotes in. Rinpoche signs each book for them and writes a mantra in it as an extra blessing. By this time Rinpoche looks really tired but insists he wants to shop more! He wants to buy very nice shoes for an especially kind female student. I try to explain that getting the right style and size is very difficult. Of course this doesn’t dissuade Rinpoche. So before you know it, we are in Lane Crawfords (! ), an expensive shop that doesn’t even allow you to take pictures inside. Rinpoche and several Sangha and lay students moving about this place does cause a bit of a stir! After a lot of checking we buy the shoes (I’m not going to mention the price) and we are off, back to the center with our gifts. #9 was found and delivered! It is the day after our arrival in Hong Kong. There is no program so Rinpoche is free. It is morning and Rinpoche is meditating and doing prayers. Rinpoche keeps silent every morning until prayers finished. Breakfast is usually taken into his room and he has it at some stage when he wants, never while it is hot. Hours go by and Rinpoche has lunch at about 5:30 p.m. Offering the food takes time and so the meal is never hot. Rinpoche continues through the evening in his room meditating and reading texts. We have a guest from overseas over for dinner. Rinpoche comes out of his room at about 11 p.m. for dinner, very warmly meeting our guest. The offering prayer for dinner starts shortly after our guest arrives. Rinpoche goes through an elaborate prayer and meditation on emptiness, in fact, he covers the whole path to enlightenment! It is now midnight and the prayer/meditation is still going on. There are seven of us at the table. One is on the verge of snoring, the guest is occasionally answering emails on his Blackberry (holding it under the table, being very discreet). Meditation continues. It is now 1 a.m. Around 1:15 a.m. Rinpoche finishes and bursts into laughter announcing the puja has finished! (The food is never hot.) We eat and watch the BBC news. The night goes on. Then protector prayers, a little discussion here and there, and we finish around 7 a.m. Not everyone made it through to the morning as there is the schedule for the next day starting early. A meal with this yogi is never hot … but always blessed! Then, as we are walking away to breakfast, Rinpoche says to me, “I want to offer lunch to the Sangha and then we can take a boat ride on the lake and bless the water and fish, and offer them food.” (The owner of the hotel has a very large lake created on the grounds and uses it for releasing fish, etc. He is a very kind and generous Buddhist.) I remind Rinpoche that the whole day is filled and that we have a big fundraising dinner starting at 7 p.m. with 500 people, so there is no time for rest. This time, the look I get is, well, it has a nice touch of wrath, more like a fierce smile. The day goes on and we are at the dinner in the evening — an excellent evening with the teenagers of Losang Dragpa Centre’s 16 Guidelines group offering great entertainment. The evening is to raise funds for the Sera Je Food Fund that Rinpoche initiated 20 years earlier. The evening finishes a little after midnight and we go back to the hotel where we need to pack nine large suitcases, four trolley bags and four backpacks, as well as find people who are going to the USA to take things back, and people going to Hong Kong (the next stop) as we always have too much! Most of the luggage are texts and gifts. The packing is an art. It’s complex and highly technical, and requires a great deal of patience as there are so many things. It really takes a lot to figure out how to get all of it from one place to another. I always end up debating with Rinpoche that we are going to be way overweight … and we always are! Maybe I’m exaggerating … no, not really. At the airport, while checking out, we find we are missing a bag! Where did it go? We try to stay out of an argument with the airline people, as they say we only have eight bags checked in. “We gave you nine!” We search everywhere and can’t find #9, so the airline must have it. It goes back and forth for 90 minutes! Rinpoche always spends time thinking about what gifts to buy and for whom — we absolutely have to have gifts. At the airport in Kuala Lumpur, we go shopping and Rinpoche buys a few hundred dollars worth of gifts for the next stop. Rinpoche puts a lot of thought into it. We have to have nice gifts for people, the right things for the right people. This time, Rinpoche bought lots of pure silk scarfs and two hand-beaded purse. It takes time. We then spend over an hour reading/browsing different books in the bookshop. Then, we suddenly have to rush for the flight. We are the last on the flight to Hong Kong! We get three and a half hours to relax before we are greeted by many students at the Hong Kong airport and the Hong Kong schedule begins. Teachings in Malaysia are going very well. There is quite a full schedule. The program is mostly being held in a nice hotel. We met the owner, one of Malaysia’s wealthiest citizens and a very devoted Buddhist, several years ago. We had lunch with him yesterday at another of his hotels. The hotel has a few exhibition halls. 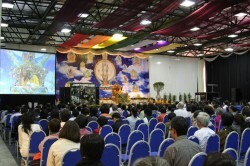 The Chenrezig nyung nä program was originally to be held in the biggest hall for 10,000 people. But at the last minute, the hall was not available. Lama Zopa Rinpoche has come to Losang Dragpa Centre to bless stautes of the 17 Nalanda Pandits. We arrived and were greeted by many students. Gradually, Rinpoche made it into the gompa. Rinpoche was supposed to consecrate the new statues of the 17 Nalanda Pandits in the garden as well as a large Dzambala statue, etc. Instead, Rinpoche lead all the gathered students in prostrations. That became a teaching for a few hours. Then there was a tea break. Some confusion arose as the statues had not been blessed and now it was time for the evening talk. Rinpoche came up to his room for tea and some people came in a little later. In the process of talking with them, Rinpoche started to give refuge … Meanwhile, people in the gompa are not sure what is going to happen next! Then, the altar in Rinpoche’s room catches on fire! I scramble to put it out. There is lots of smoke because plastic is burning, and out of the corner of my eye I see Rinpoche — he hasn’t missed a beat and is still giving refuge. It takes some time to put out the fire and there is lots of smoke. We put a fan on near Rinpoche trying to blow out the smoke — and Rinpoche is still giving refuge! 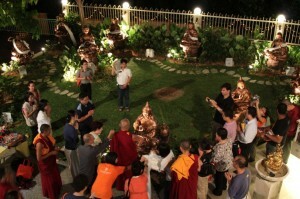 Lama Zopa Rinpoche offers khatas to one of the statues that adorn Losang Dragpa Centre's garden. Rinpoche finishes giving refuge and says he will give the talk. Suddenly, the power goes out. Darkness! No mics, no fans or air conditioning. After an hour, and getting the electrician to fix the problem, we start again. The talk starts and finishes near midnight. People come up for blessing, which takes a while. Rinpoche wants two lines coming up to him, one from the front and the other from the back! It is awkward, but what to do? Malaysians are coming from the front and Singaporeans from the back — it is nice, quite cool. We are getting through the crowd a little quicker! 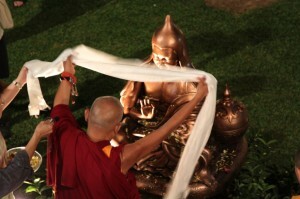 Lama Zopa Rinpoche offers a flower to a statue of one of the 17 Nalanda Pandits. Now, it’s after midnight and people are speculating what’s going to happen next! Because the consecration hasn’t happened yet, there is some pretty wild speculation. Rinpoche says to me that the blessing can be done another time. Geshe-la also agrees. Rinpoche gets off the throne and starts blessing the statues one at a time, offering prayers, khatas and flowers. Each of the pandits takes time. Then there are the prayer wheels and stupas. The crowd is thinning out as it gets late, we finish with dedication around 2:30 a.m. — not too bad! Then we drive half an hour back to the hotel and have dinner … and relax! The day after arriving in Kuala Lumpur, Rinpoche started the first day of the Great Chenrezig Initiation. The initiation was held at the exhibition hall of the Wellness Hotel, where we stayed. About 2,000 people attended; on the second day, possibly more. Rinpoche’s motivation and explanation for the initiation on both days lasted about five hours with a break in the middle. The actual preparation on the first day only took 30 minutes and on the second day, the actual initiation took about 45 minutes to an hour at the most. Finishing at 8:30 p.m. both days surprises many old students (including myself!). What is Rinpoche going to with all that time left in the evening!? He sees people, does some prayers and mediation, and then a few more prayers while watching BBC news. Breakfast at 5-5:30 a.m., more meditation as the morning drifts on, and sometimes the appearance of sleep while still sitting up.